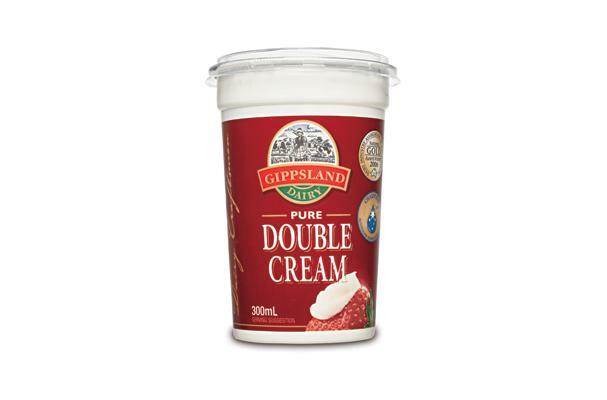 Double cream is the name in Britain for a very rich cream — containing 48%% butterfat. Mouthfeel: Very rich and creamy, At times a bit oily. Buying: In the US, you may need to seek double cream at an actual dairy or high end specialty food store as most major chains and markets offer heavy cream which can be as much as 25% less butterfat than a true double cream. Double Cream will have about 48% butterfat. Double Cream can not only be whipped, it will whip up firmer than whipping cream, which is why fancy cake makers will prefer it to whipping cream. If you want it less firm but to have more volume, add a tablespoon of milk or an egg white per 5 oz (2/3 cup / 150ml) before whipping (this lowers the butterfat content a bit, making it a bit less dense, allowing more air in and thus more volume.) Don't overwhip, though, or it will take on a grainy appearance, and if you kept on overwhipping, you'd practically end up with butter. Double cream is generally considered for use in chilled desserts such as puddings or as a topping itself, separation can occur with heating or used with acidic foods. In the United Kingdom you will find that the butterfat content is legally defined at 48%, whereas the US does not regulate use of terms such as "heavy" or "light" cream. Canada and Australia follow similar form to the US, with the exception that "light" will mean low fat in Canada. These countries can vary, by producer, a range of about 10%.